Novels with pictures in them? It’s hard to know what to call, well, novels with pictures in them. And yet, the first of these books was, it seems, published in 1892 by the Belgian writer Georges Rodenbach: his Bruges-la-Morte includes 35 pictures, mostly picture postcards of the streets and canals of Bruges. 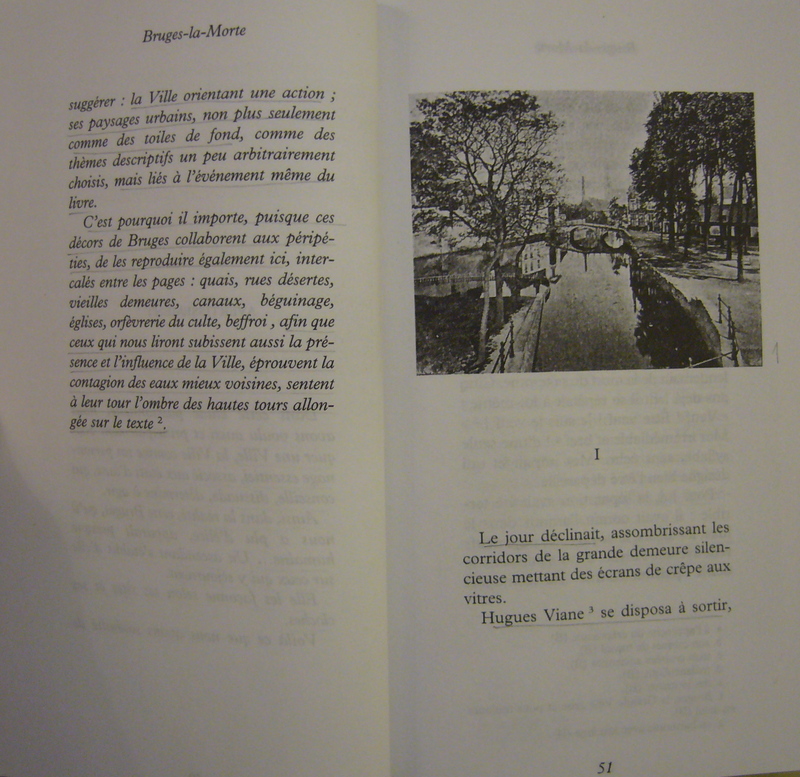 The first photograph in G. Rodenbach's Bruges-la-Morte (from the 1998 edition published by Flammarion and edited by J.-P. Bertrand and D. Grojnowski.). Since then, of course, a fair number of these books have been published, from André Breton’s Nadja and Virgina Woolf’s Orlando (both published in 1928) to the many such novels published in recent years: from Dave Eggers’ You Shall Know Our Velocity in 2002 to Jonathan Safran Foer’s Extremely Loud and Incredibly Close in 2005, and from Marianne Wiggins’ The Shadow Catcher in 2007 to Tim Pears’ Landed in 2010. W.G. Sebald is no doubt to blame, as it were, for the resurgence of the genre (if it can be called a genre at all). The four novels he published during his lifetime – Vertigo (1990), The Emigrants (1992), The Rings of Saturn (1995) and Austerlitz (2001) – caught the attention of writers and critics as much as of scholars and publishers. However, Sebald was reluctant to call his books anything but “prose works”, a rather evasive and somewhat unhelpful description for this type of book. Front cover of W.G. 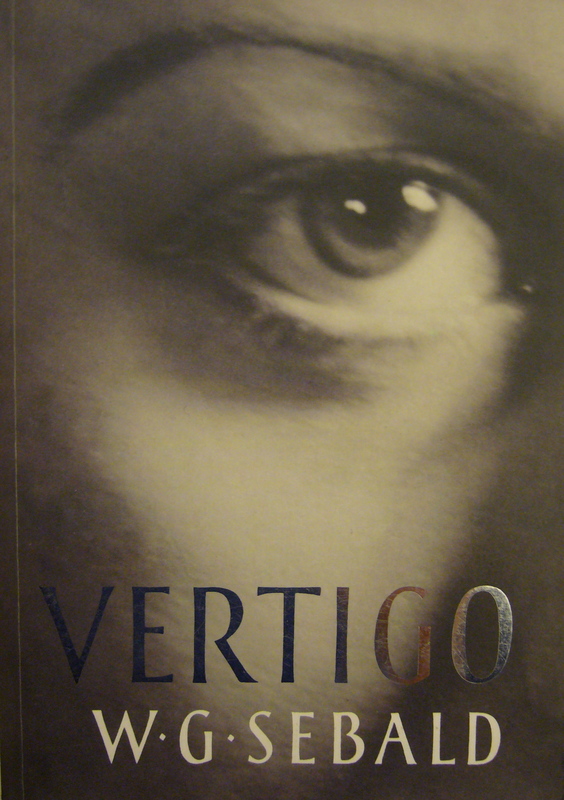 Sebald's Vertigo (London: Harvill Press, 1999). The thing is, there is no agreement on what to call these works. Wright Morris, who published The Home Place, for instance, in 1948, used the term “photo-text” to describe the books he created out of his own texts and photographs. On the other hand, Jack Finney’s Time and Again (1970) is promoted on the blurb as “the classic illustrated novel”, while Peter Delacorte’s Time on My Hands (1998) is subtitled “A Novel with Photographs”. Scholars have variously referred to these works as “iconotexts” or “image-texts”, or have spoken more generally of “pictorial or visual fiction”. Alternatively, one might prefer speaking of “photography-embedded fiction”, the term chosen by Terry Pitts, who has written much that is interesting and informative on Sebald and on other similar works on his blog Vertigo. I’m not quite sure what to make of all this. But in any case, this is one type of book I’m interested in and which I wish to write about on this blog. Having said this, I hope to write about other types of books too. This entry was posted in Picture novels and tagged Bruges-la-Morte, fiction, iconotext, photography, phototext, picture novels, Rodenbach, Sebald, Vertigo. Bookmark the permalink. 1 Response to Novels with pictures in them?